Nevron Map for SharePoint is an advanced web part for all versions Microsoft SharePoint (WSS3.0, SharePoint 2007, 2010 and 2013). It is designed to provide an easy and powerful way to create choropleth maps that are tightly integrated with your data. - Multiple Map Layers - unlimited number of map layers are supported. Each map layer can display either a predefined or custom ESRI map. - Multiple Legends - unlimited number of legends are supported. Each map layer can be assigned to a different legend. Legends can be manually positioned or docked to map and map plot area. - Multiple Titles - unlimited number of titles are supported. Titles can be manually positioned or docked to map and map plot area. - Predefined Maps - the web part can display predefined maps of the World, USA, and all USA states. - Custom Maps - the web part can display custom ESRI maps (ESRI Shapefile). 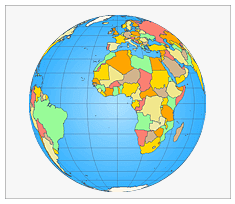 - Map Projections - support for 22 map projection types. - Map Fill Rules - support for 2 and 3 color gradient filling rules as well as distinct value filling rules. - Map Fill Rules Distribution - support for Equal, Equal Interval and Optimalmap values distribution modes. - Map Legend - each map layer can be annotated on a different legend. Legend modes include fill rule ranges and items with template options. - Map Zooming - options to specify the items of the maps to which to zoom. Several zooming modes are provided including Zoom To Bounds, Zoom to Layer, Zoom to Data Bounds Shapes and Zoom to Shapes matching a specific criteria. - Code Embedding - allows you to modify every aspect of the map appearance using C# or VB.NET code.